I have multiple closings on the same day, can you work around it? One thing that sets us apart from the competition is how accommodating we are, so we can create a plan and work with you to ensure a successful move. Our schedule tends to fill up around the beginning & end of the month so please plan about two weeks in advance. If we have openings, moves can be done at the last minute but planning ahead ensures that your move falls on your selected day of choice. Can you move the contents of a home in one day? Many times, we can move an entire home in one day. It depends on the size of the house, the number of belongings that need moved, and if you want us to provide packing services. Will you move boxes that I have packed myself? What about containers like bags, bins, suitcases, etc.? We move already packed items all of the time, so it is not a problem. What is ideal is to communicate with our movers what is in the boxes or containers so decisions can be made on whether or not inspection is needed to ensure better packing. It is important to ensure everything is packed properly for liability reasons, even when the customer has done the packing. What should I do to prepare for the move (ex: pull everything out of cabinets and cupboards)? If our movers will be packing your belongings, they will pack them from right where they are. You don’t need to move items out of your closets, cupboards, and other areas because this allows the items to stay together and be labeled accordingly. 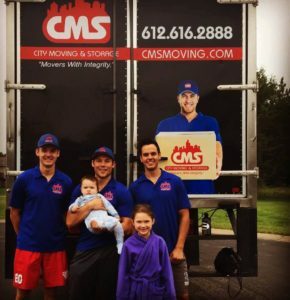 If you are packing your own items, labeling the boxes for our Twin Cities movers can be quite helpful so they know where everything goes once the destination is reached. Do you provide boxes? If so, what is the cost? We have a full supply of moving cartons available for purchase. However, our packing services come with very competitive pricing. We also have some cartons that can be provided free of charge or for rent. We accept payment after the move is completed. If you need to pay by credit card, we collect payment 24 to 48 hours before the move. Do I need to be present when you perform the move? It is in your best interest and ours that you are present during the move, although there are times when a third party may represent the customer. Having someone represent you is fine as long as they have the ability to make decisions for you. Am I allowed to assist you in packing/loading items during the move? For liability reasons, it is not ideal to help the movers load items into the truck. How do I determine the size of truck I will need? Is there a way I can estimate this? It is typically up to the moving company to decide the size of truck that will be needed. At City Moving & Storage, we have 28 foot straight trucks and tractor trailer capabilities. Regardless of how much you need moved, we are able to fully and efficiently accommodate the move. We service the immediate Twin Cities metro area of Minneapolis, St. Paul, Anoka, Bloomington, Burnsville, Eagan, Savage, Maple Grove, Minnetonka, Woodbury, Eden Prairie, and beyond. Basically, we service all of the Twin Cities and surrounding areas quite frequently, but we do serve all of the State of Minnesota.